I was up to my ears in green beans and peas from my husbands garden this weekend. I thought I would dedicate the occasion with Sweet Pea Tilda for my DT card at 7 Kids College Fund. This weeks challenge at 7 Kids College Fund Challenge Blog Anything goes with a twist of markers. You can use any alcohol marker on your image and it should be one that is available at 7 Kids College Fund Store to be eligible for the prize. I know I am nutty over the Graphic 45 papers lately, but they go so well and they are lovely. I used Tiny text to put Sugar Pea on as my friend Sandy calls everyone sugar so I instantly thought of it. 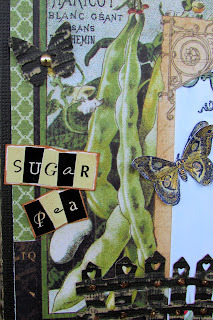 I used the Magnolia Butterfly set and punched some others to distress with Coredinations card stock. I used the Coredinations on the Magnolia Doohickey fence as well. Tilda is colored with Copics and I used the Magnolia flower corner around her also. You can see a bit of the Magnolia butterfly in this photo too. The inside of the card are Marianne dies with the Graphic 45 paper and Coredinations paper. So here is a big pot of soup I am making on the left, and also freezing beans at the same time. Hours of cutting, washing, blanching, packaging, and freezing! Only 2 boys left in the house to help us this summer. I bet the other kids are laughing as they do not have to do this anymore! lol Family fun. I made this awesome soup with everything from our garden, too bad we do not have our own cow for the cream! lol It was so flavorful from the herbs I used right from the garden, best pot yet. This is all that was left. Boil small chunks of potato's and cut green bean until tender, drain remaining water. Add milk and cream about 4 Cups, Fresh herbs, Basil, Chives, Parsley. Salt and Pepper. Fry bacon and onion together and then cut into bitty pieces and put into soup. Thicken with flour and cook on a low heat until hot, cover, turn off heat and let it sit for 2 hours as the flavors come together. That is it! mmmmm Enjoy! Thank you for stopping in to see my DT card. Please go over to the 7 Kids Challenge Blog and see what the other girls did for their cards. I encourage you all to enter their challenge so we can admire your work! I get very excited when I see my blogging friends on challenge blogs that I am part of! Beautiful card....inside and out!!!! Perfect papers and details....love the fence! Your soup looks yummy....green beans is my favorite vegetable! The card is gorgeous as always. Love that darling image. The soup looks yummy. Potatoe soup is my fav so will try your version. An absolutely stunning little garden scene you have created on your card. And the soup look so yummy. What a great card Kelly and such a cutie Magnolia. I haven't seen that image before and she's sweet. Love how the garden theme carries throughout this lovely card! And, I might add... that soup looks yummy! I'm green with envy! Your card is totally awesome and I need half of your energy! I bet the beans are delicious as well as your soup. What time is dinner tomorrow? Yum Kelly I love all of the recipes you have sent me. Your card is grand just like you and I too love Graphic 45 papers. I plead guilty - I do call most people Sugar especially if I feel like I know them. My husband calls me "sweet pea". You wear a lot of hats Kelly; Wife, Mother, teacher, cook, fantastic card maker and wonderful friend. All you need now with your soup is my cornbread!! Oh this card is fantastic, such a nice scene, and the papers are so wonderful ! And your soup seems so yummy !!! 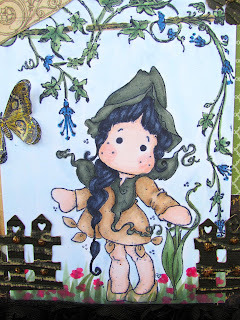 There's a gorgeous fairytale feel to your beautiful garden card, Kelly - I love it. And the soup looks pretty darn fine too! Sweet card Kelly! Love the vines and the whole feeling to the card. And that soup really looks good! :) Yummy! Fabulous card, Kelly! I love the sweet scene, and that adorable image too! Gorgeous card! I love how you incorporated the earth colors from your ingredients from your soup.... You are so clever. I love that your cards are beautiful both outside and in, Kelly. And this one is no exception. I love your colours/colouring and such a lovely layout, too. This is such a sweet card and gorgeous coloring. The soup looks soooo good and wow that's some haul from the garden!! Beautiful card Kelly and that soup looks yummy too. so adorable Kelly! Love your Tilda coloring and scene creating! Gorgeous inside too!